In the last decade, it has become more and more common for more companies to focus on three particular areas. This article details the drive and vision of Van Aalst Bulk Handling in terms of its plans for the future, and discusses those three interesting areas. Van Aalst Bulk Handling is known worldwide for the manufacture of reliable and low maintenance pneumatic shiploaders and unloaders for cement, fly-ash and china clay. So, what it does is known by the majority of people in the interesting market of cement, but why and how it is done is less known. Therefore, below is an explanation of the company’s focus on the planet, people and profit. A few years back, the people from Van Aalst had the honour to meet the first Dutch astronaut ever to go into space. His name is Wubbo Ockels, and he was in 1978 selected by the ESA (European Space Agency) and NASA (National Aeronautics and Space Administration ([USA]) to work on the Space-lab programme. Eventually he went in to space in 1985 for seven days with the space shuttle Challenger, the same one which exploded 90 days later with the first female astronaut on board almost seven minutes after take-off. Wubbo Ockels’ journey was a successful one and this trip is still a very important part of his life and work today. He now is associated as professor Aerospace Sustainable Engineering and Technology (ASSET) at the University of Groningen. He is still a very enthusiastic and inspiring man. At the meeting with Van Aalst, he started with showing a picture from planet earth 400km out in space, and let us realize the sensitivity and vulnerability of the planet we all live on. He mentioned the eye-opening fact that everything on earth and earth itself is only protected by the atmosphere, approximately 40km high. This is, of course, a quite ridiculous distance when you think about it. Another interesting thing is the fact that everything that is on this planet is there to stay. He tells everybody that they are actually ‘Astronauts of spaceship Earth’, and that everyone is responsible for this beautiful planet. Van Aalst Bulk Handling takes this responsibility very seriously. Therefore, we ensure that every new piece of equipment that we produce uses less power and energy, and is lighter, needing as little transportation as possible. Van Aalst’s technical innovation department spends almost 30% of its time improving these characteristics — and it demands the same dedication from its partner suppliers. As an extension of this,Van Aalst Bulk Handling also wants to take care of the human species that live on this ‘spaceship’. Besides the fact that dirty and dusty workplaces are very counterproductive, they can also result in a negative image of the workplace — a bulk handling terminal, for example. Employees’ motivation improves when they are in a clean working environment; they get sick less often, and are much more productive. Low maintenance equipment is another way of taking care of people, because it significantly decreases the (mostly heavy and dirty) work in a cement terminal. For this reason,Van Aalst always uses the most innovative equipment, with the lowest wear, so that any dust emissions are not caused by Van Aalst equipment. These days, the ever-more-stringent environmental regulations demand all types of certificates relating to safety. Further, more and more companies demand a good, clean terminal. In the future, certificates will be awarded more frequently as safety measures are followed more closely. Nobody denies that profit margins are important — equipment is bought only by businessmen. Equipment is purchased with the aim of making money. Van Aalst combines all the above factors, and combines them with the need for profit. Profit is the real drive and determining factor for the viability of companies, and their employees. Van Aalst is always seeking to use less material, but material that is stronger and more durable. Durable is also very sustainable and, in addition, almost all the material used can be recycled. Other qualities that contribute to the profit of the end-users are the already mentioned low maintenance, lower power consumption and high level of reliability. All this is achieved by customizing high-quality designs, that can be spray-painted with the customer’s livery if required. When using real Van Aalst equipment, customers are guaranteed that a low carbon footprint, consideration for natural resources and an understanding of the need to make a profit all go hand-in- hand. On top of that,Van Aalst equipment also offers excellent residual value. In the past, second-hand machines have been sold for almost half the initial purchase price. Van Aalst machines have been proven to be very reliable, and the aim is always to deliver the lowest costs of ownership for every customer. In this way,Van Aalst is able to remain highly competitive. The company has a strong philosophy that it works for the planet, people and profit, for all our children and last but not least for its customers. VIGAN Engineering S.A. is a Belgian company with its headquarters in the Nivelles industrial area about 30km south of Brussels at the heart of the European Community. VIGAN manufactures a complete range of pneumatic & mechanical conveying systems for products in bulk. Not only does it manufacture and supply equipment, it also manages complete turnkey projects. All the company activities take place on the same 10,000m2 site which enables easy and very quick exchange of information among all departments including sales, engineering, manufacturing, quality control and after-sales technical assistance. VIGAN engineering department with 450m2 space boasts latest software technologies (such as CAD–CAM types). 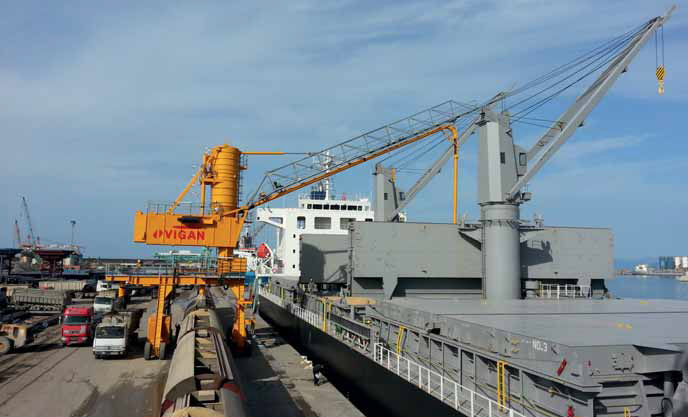 VIGAN has a major presence in the pneumatic bulk handling market. The pneumatic equipment principle is based on conveying products using air, which handles them inside the pipes and therefore behaves as the transport medium. This means that at the suction nozzle, and thanks to the vacuum produced by the turbo blower(s), a certain amount of air is mixed with the free flowing products. The sufficient air speed in the pipes will maintain the products into the air flow and therefore they will be conveyed in the same way as the air. In the central part of the equipment, at the arrival of the products inside the receiving cyclone or hopper, the air is sucked upwards into the turbine, while the products settle down into the hopper bottom or cyclone. After being conveyed down by an airlock (rotary valve), the products are moved either pneumatically or mechanically to their final destination such as into trucks, railway cars, silos and/or storage warehouses. VIGAN’s pneumatic unloaders are suitable for any size of ship, because its mobile machines can be put on the deck of large vessels, while its large size unloaders can have a boom with suction pipes of up to 28 metres for post-Panamax vessels. Recent contracts for VIGAN include the supply of CSU (continuous ship unloaders) to regions including Egypt and Bangladesh. Details of these deliveries can be found on p94 of the January 2014 issue of Dry Cargo International. VIGAN has also had a few additional sales of its equipment to South East Asia, North and East Africa and Europe. Currently VIGAN is delivering 12 large size NIV-type machines, with capacities from 250–300tph (tonnes per hour) to Algeria. One of the first machines delivered in the port of Jijel in Algeria is on rubber wheels with diesel generator, but is also equipped with a switchboard for electrical feeding through a cable reel system already mounted on the machine. In Algeria,VIGAN has delivered eight small mobile machines during the first trimester of 2014. There are also several interesting projects in the pipeline, the details of which remain confidential at the time of going to press. VIGAN remains committed to its principles of innovation, reliability and customer service.